Apparently, by June of 2015, this ship’s graveyard had grown to a collection of nearly 50 fishing boats, freighters and tugboats, most of which are deemed abandoned due to debts and liens of bad commerce. 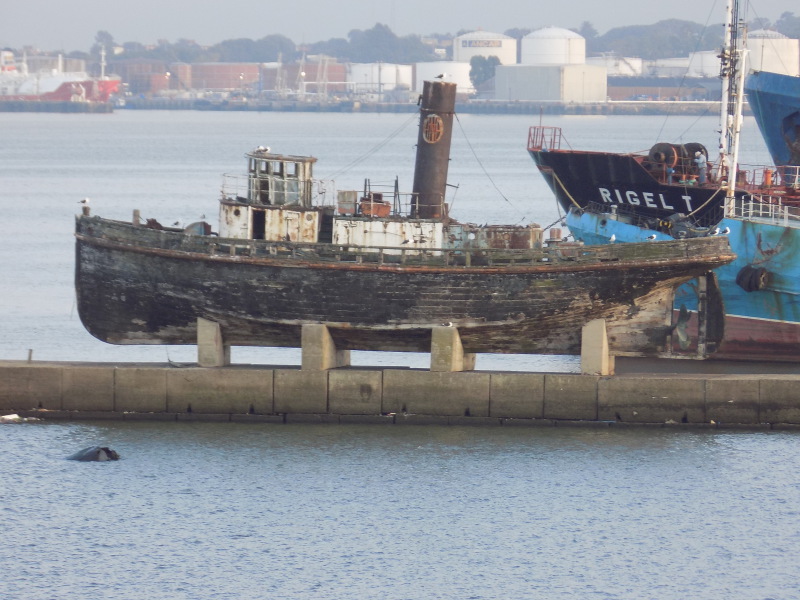 As described in the article, it is the stated intention of the Uruguayan government to re-float and scrap this collection of abandoned ships. The DIEGO CAPELLA Y PONS is a unique case having been owned by the Administracion Nacional de Puertos. It would be nice to see it restored as an entrance piece at Montevideo Harbor. Bjørn Knudsen offers further technical details on the DIEGO CAPELLA Y PONS at http://shipspotting.com/gallery/photo.php?lid=2269187 . The DIEGO CAPELLA Y PONS is not alone. It has been mounted on a pier like a statue at the front of a ship’s graveyard at the entrance to Montevideo Harbor. When I was there in 2014, there were about 40 other ships partially sunk and tied together behind it. I am sure there is more of a story behind this. Can anyone help me with the story of this tug? It was taken in Montevideo, Uruguay in May 2017. Just interested in the tug and it's history. Thanks. This photo has been shown 1,166 times since it was added to the site.